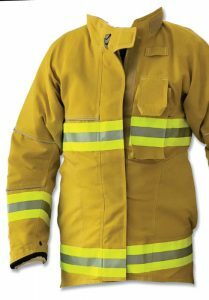 Firefighter jackets made by Innotex using fabric woven by Monterey Textiles, feature FilSpec™ FireFil™ corespun yarn comprising para-aramid, glass and Vectran®. Produced using proprietary modified air-jet spinning technology, FilSpec™ FireFil™ glass-core yarn offers unique flame, cut and tear resistance. FireFil™, developed by FilSpec Inc., Quebec, is a corespun yarn featuring glass filaments in the core surrounded by high-performance textile fiber selected to address the particular needs of the intended application. The company reports the yarn is flame-, cut- and tear-resistant — offering advantages including no after-flame, no melting or dripping, no shrinkage in extreme heat, and 200-percent higher tear strength than is required by the NFPA 1971-2013 standard. FilSpec developed the FireFil yarn technology and potential applications over a period of about four years. The company was already making a corespun yarn of nylon and polyester, and the idea of developing a flame-resistant (FR) yarn for knitted mattress ticking led to the idea to replace the nylon core with a glass core. 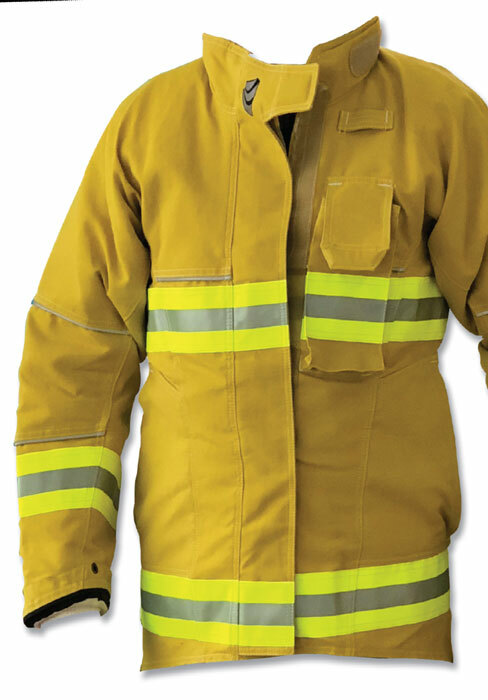 FilSpec worked with weaver Monterey Textiles, also based in Quebec, to develop woven fabrics for firefighter applications, and woven fabrics for other applications soon followed. Sébastien Couture, partner and R&D manager, explained that the makers of FilSpec’s air-jet machines said the machines weren’t designed for and wouldn’t work for processing such a yarn. In response, Couture and his team came up with their own proprietary solution. “We had to modify the spinning machines, and now, all of our machines are modified to be able to do the glass-core yarn,” he said. In addition to having high strength and FR properties, the glass acts as an insulator. In this regard, because of what Quintal described as “a kind of micro-swelling” of the glass filaments during washing — which creates air pockets among the filaments — the thermal barrier performance improves with washing rather than deteriorating, as is typical in conventional thermal-barrier fabrics. Also, the very low elongation of the glass filaments must be considered in the dyeing process, as there is no shrinkage during processing. For the firefighter fabric, Filspec worked with Monterey and firefighter gear maker Innotex, Quebec, to develop a fabric comprising two-ply yarns of para-aramid spun around a glass core, and periodically inserted yarns that include one ply of para-aramid spun around a high-strength, melt-resistant Vectran® core in order to add further strength. Another woven application, for a welder’s suit, features Lenzing™ FR and wool spun around FireFil’s glass core to provide protection against metal spatter. The company has also made glass-core yarns blended with Kevlar® or polyester for cut-resistant knitted gloves. For more information about FilSpec™ FireFil™, contact Dominique Quintal +819.573.8709; dquintal@filspec.com; filspec.com.